Half term activities are open to all juniors whether they have played at the club before or not. There will be 3 fun mornings on Monday, Tuesday and Wednesday for children aged 4-10 which will include coaching and games. 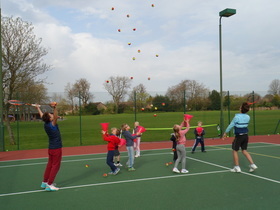 There will be 2 fun sessions on Thursday and Friday mornings for those aged 11+. There will also be more formal tournaments on Thursday afternoon for those age 11-14 and on Friday afternoon for those aged up to to 17 which will count towards the players LTA rating.